Ingredients - Sweet Almond Oil, Fragrance ,Sesame oil,Cyclomethicone ,Grape Seed oil ,Vitamin E acetate. Directions for Use - Dab on pulse points (insides of wrists, behind the ears etc. ) 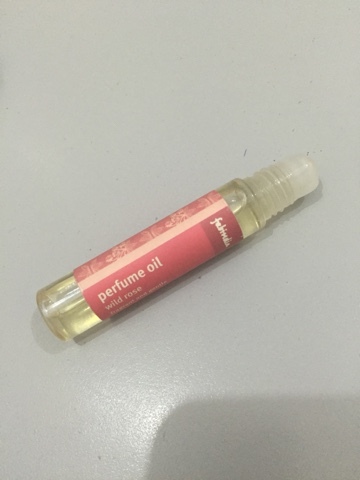 for long lasting fragrance .It can also be applied through hair strands as hair holds the perfume longer . 2. Handy and convenient size ,also comes with a roll-on applicator tip so not at all messy . 3. Skin friendly ,contains no paraffins and phthalates .It has sweet almond oil and sesame oil as its bases which are both nourishing for the skin too. 4. 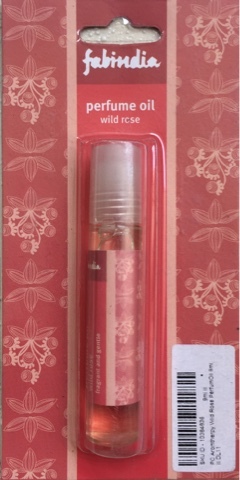 Soft soothing wild rose (sweet floral) fragrance .That is what I love about it .With other perfumes, the first application can be over powering which is not the case with this perfume oil .It has a gentle sweet fragrance and since you can easily store it in your wallet ,it can be re-applied throughout the day . 5. Unlike spray perfumes that can discolour your precious jewellery , these can be easily worn with any metallc jewellery too. 1. Available only at Fabindia stores or online - here . 2. On me , the fragrance stayed for hardly one hour .Though the bottle is handy enough to be carried but I wish it could at least last 2 hours .So it does not last even decently long and you will need to reapply often.Thus the price is not justified ,a single bottle might not last 1 month even . 3. The perfumes can vaporise, so you need to store them in cool ,dark places away from sunlight . FINAL VERDICT - I rate it a 3/5 . 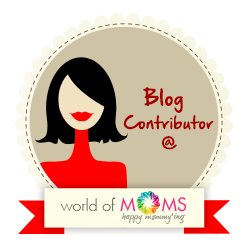 I love the subtle rose fragrance and the fact that it will neither harm my skin nor my jewellery but at the same time I wish I did not need to re-apply it that often to smell good through out the day .